The concept of Energy and matter is not new to us and does not start with Einstein’s days of E=mc2. Let us look at how our letters are formed from Aksharas then people would know that the concept of Energy and Matter is old as our language. In Tamil there are two kinds of Aksharas/Letters. They are உயிர் எழுத்து – Uyir Ezhuthu (Life / Energy letters – 12 letters) and ெமய் எழுத்து – Mei Ezhuthu (Body / Matter letters – 18 letters). 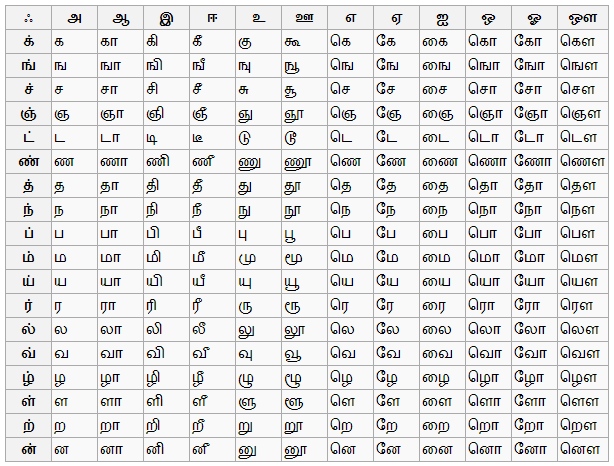 Both put together it is 30 letter pack for Tamil as alphabets. Now both have to combine to give letters called “body with life” which are called uyir mei Ezhuthu. This combines to form 18*12 which is 216 letters as Uyir Mei Ezhuthu. For example க்+ அ = க in Tamil and क़ + अ = क in Sanskrit. So the formation of letters itself is a science where Matter (Body) combines with Energy (Life) and then the living organisms (Body – life letters) are formed. உடம்புடன் உயிர் வந்து ஒன்றுவது இயல்ேப – ெதால்காப்பியம் . This is over 2500 years old which states that life comes and joins a body in language and this is nature. ெமய்ெயாளி உயிெராலி சிவணுதல் இயல்ேப – ஐந்திறம் (Aintiram). This is over 12000+ years old which states that same thing and adds that body is like light and life is like sound and they merge and this is siva’s nature. This certainly means that both Body and life are not formed at the same – as popularly believed. Life comes and joins the body to give a living being – in the above case the letters are the living beings. Masculine names: All the names shall end with the phonetic a, im, in , ir, aha etc. Examples are Ram, Shyam, Raman, Kannan, Kishan, Vivek, Adam. So phonetically names like Catherine is a masculine name because it ends with “in” phonetically. Feminine names: All names ending with phonetics aa, e, I, oo etc. Examples are Radha, Ramya, Savithri, Gayathri, Uma, Rosy, Isabella etc. Same way phonetically Joshua is a feminine name. Vishnu and Lalitha sahasranamam follows this rule and hence one invokes Shakthi as lalitha and the other invokes Purusha as Vishnu. Just to conclude this part, I think we looked at how science is an integral part of our language formation and for us science has always been about the knowledge and nature of the space and we believed that space manifested itself as the physical world. This entry was posted in General, Science, Spirituality and tagged articles, inspiration, language, life, sanskrit, science, spirituality, tamil, thoughts by Ganesh. Bookmark the permalink. It is interesting to ponder the reason for the modern worlds’ almost total refusal to acknowledge, or even allow room for, existence of prior knowledge of esoteric subjects: it is fair to assume that this is partly due to 1) the arrogance of modern ‘man’, 2) fear of losing face by being the second (or more) cab on the rank, 3) the race barrier and, no doubt a few more. How much better if the old and the new were considered together with, at least, equal respect; and how much better still if, as in the present, where reliance is placed on past, but recent, knowledge, reliance is placed on ancient knowledge as a stepping stone to greater things. However, that is the nature of ‘man’ . . . . and all knowledge exists for those who want it. Right? Beautiful. i love symbolism. and the way you explain it such an art. i love this. I’m not guaranteeing that all this is true, since I have no idea, only that it offers an interesting perspective. This is all fascinating and frustrating because I cannot grasp all of it. I am honored that you visited my blog and will be following yours.